Do you drive an 18 Wheeler and wonder about parking at the Pioneer Motel? See map below! What can you do while in Challis? How about a river trip or kayaking in nearby Stanley, Idaho. 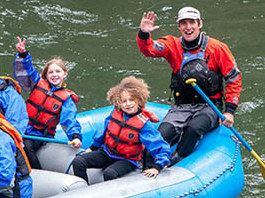 White Cloud Rafting is ready to take you! The "green banner" in the picture above is from "TripAdvisor" and shows we're the winner of the 2016 Green Leader Award! We are also the winner of the Green Leader Award for 2017!